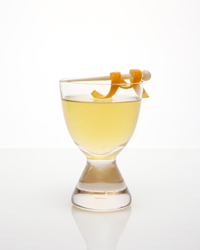 In a cocktail shaker, muddle the lemon twist with 1 orange twist. Add the pear and muddle again. Add ice and the tea, elderflower syrup and lemon juice; shake well. Fine strain into a chilled coupe and garnish with the remaining orange twist.